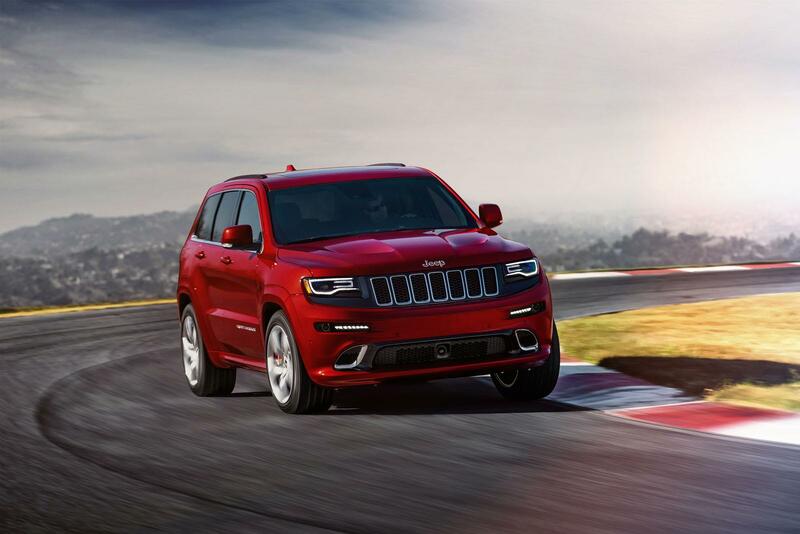 H Jeep παρουσίασε το Grand Cherokee SRT ΜΥ2015. Διαθέτει ενεργό σύστημα εξουδετέρωσης εξωτερικού θορύβου το οποίο χρησιμοποιεί τέσσερα ειδικά μικρόφωνα τα οποία ακυρώνουν τους ενοχλητικούς θορύβους στη καμπίνα των επιβατών. Μηχανικά, ο 6,4-λίτρων V8 HEMI κινητήρας έχει δυναμώσει και παράγει 475 άλογα με 637 Nm ροπής (+5 άλογα και +5 Nm ροπής). Συνδυάζεται με ένα 8-τάχυτο αυτόματο κιβώτιο, με τα 0-96 χλμ/ώρα να τα κάνει σε 4,8 δευτερόλεπτα με την τελική ταχύτητα να αγγίζει τα 257 χλμ/ώρα. Παράλληλα η Jeep ανακοίνωσε και την Red Vapor Special Edition του αυτοκινήτου, το οποίο διαθέτει μαύρα γυαλιστερά διακοσμητικά, κόκκινο κάλυμμα κινητήρων και μαύρες χρωμιομένες ζάντες 20″. Στο εσωτερικό υπάρχουν κόκκινες λεπτομέρειες, χρωμιομένα διακοσμητικά και κρυφό φωτισμό. 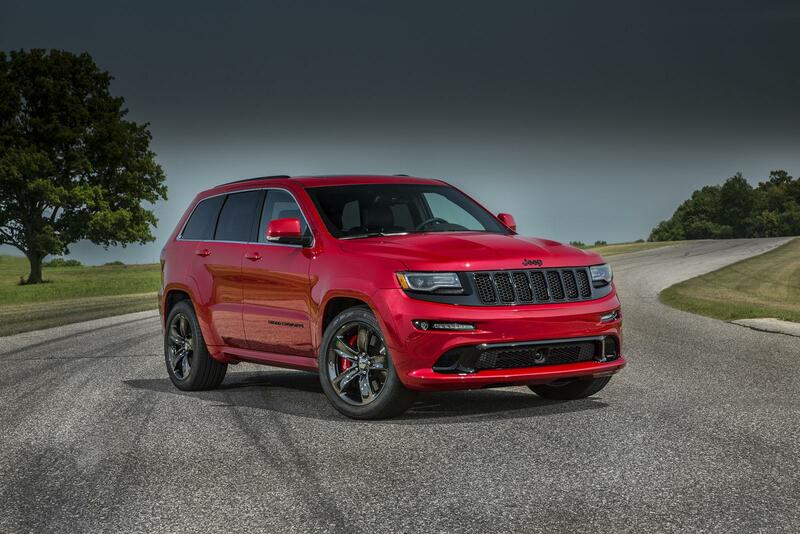 Horsepower output improves to 475 while torque also increases to 470 lb.-ft.
September 2, 2014 , Auburn Hills, Mich. – Jeep® Grand Cherokee SRT owners have come to expect – and appreciate – a vehicle that is powerful and refined, luxurious and functional, muscular and stylish. 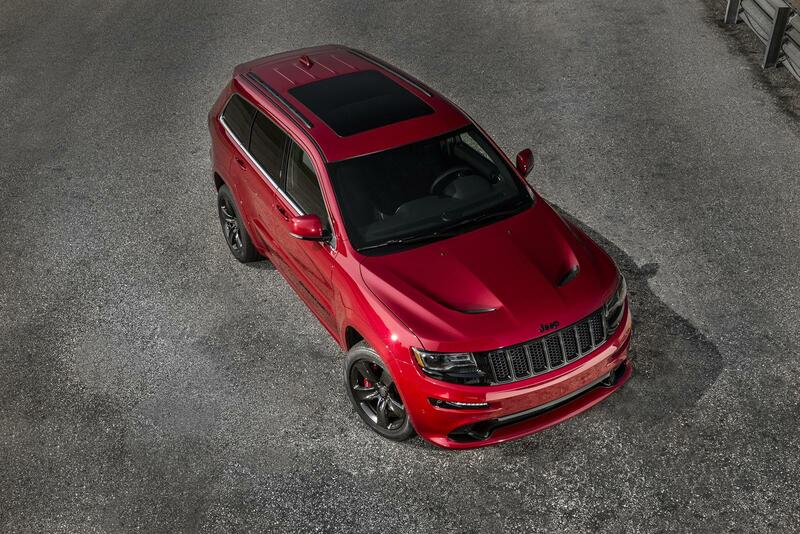 For 2015, the most awarded SUV ever builds upon this proven success with more horsepower and torque, a new Red Vapor special edition package and new Active Noise Cancelling (ANC) technology which further heightens Grand Cherokee SRT’s refinement and fun-to-drive factor during a comfortable daily commute or a more spirited drive at a favorite race track. 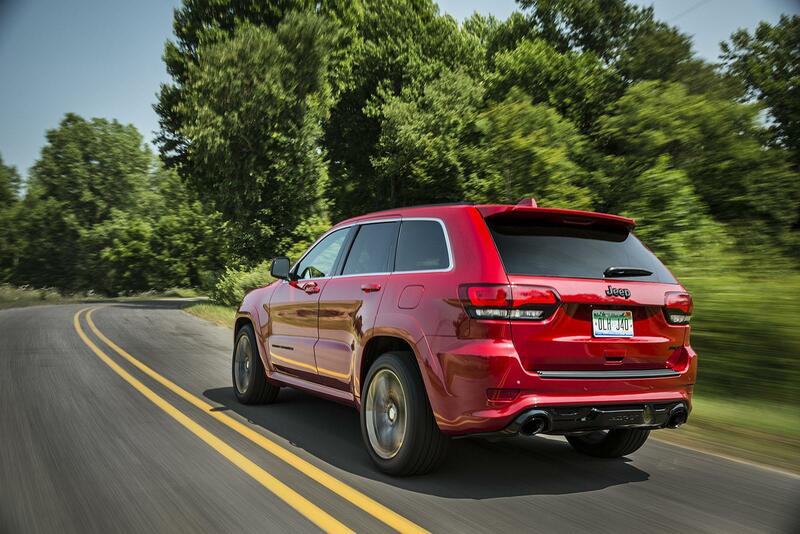 Mindful of improving refinement while preserving the Grand Cherokee SRT’s high-performance character, engineers developed an Active Noise Cancelling (ANC) system. Using the vehicle audio system and four strategically located microphones, it automatically introduces sound to the cabin. 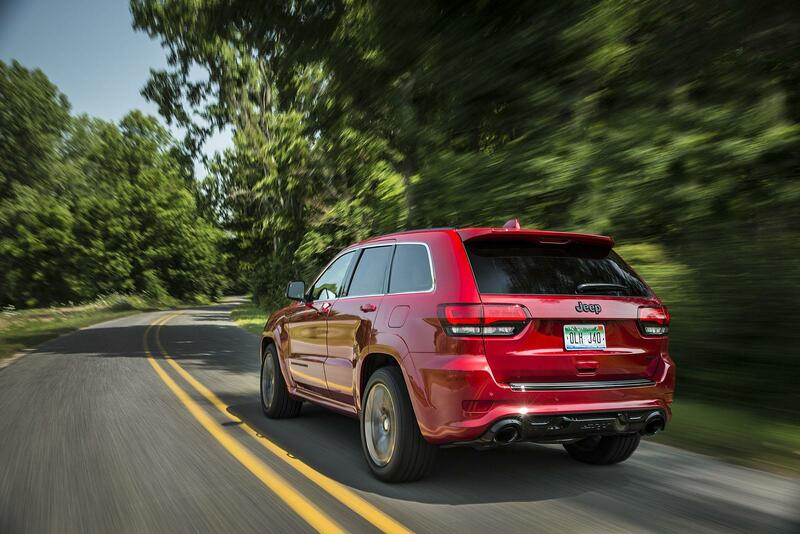 The result is enhanced sound-system clarity and unfettered enjoyment of the Grand Cherokee SRT’s signature exhaust note. The new Red Vapor special edition package introduces unique exterior and interior styling cues to enhance the distinct, performance-oriented looks of the award-winning SUV and is available on three body colors: Redline Red Pearl Clear Coat, Brilliant Black Crystal Pearl Coat and Bright White Clear Coat. On the exterior, standard five-spoke 20-inch “Goliath” wheels are finished in Black Chrome with bright chrome center caps, while additional gloss black appointments include the SRT liftgate badge, Jeep hood and rear light bar badges, Grand Cherokee door badge, lower grille bezels and upper grille inserts. Inside, the exclusive SRT logo on the high-performance designed steering wheel is backlit and the steering wheel bezel changes to an anodized silver finish. Light black chrome replaces the standard bright chrome and Radar Red accents are used throughout the cabin to enhance the luxurious, muscular interior. Under the hood, engine beauty covers trimmed in dark red complete the special edition package. 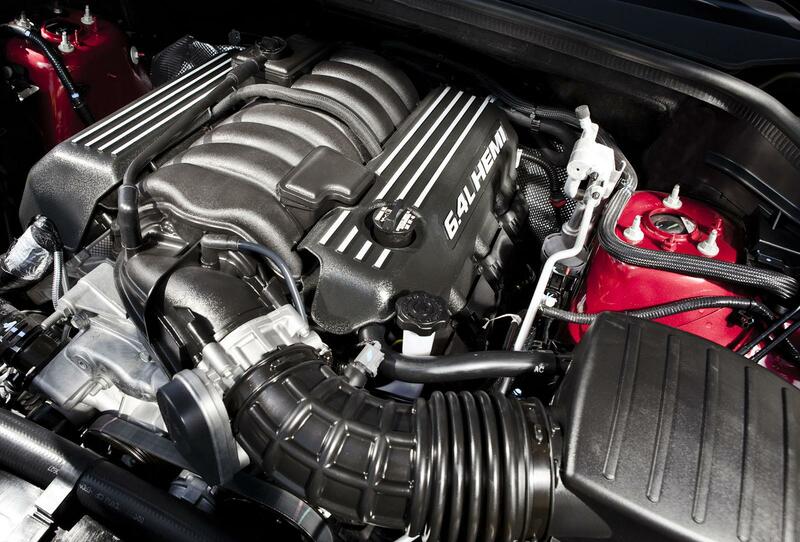 Awe-inspiring powertrain The proven and powerful 6.4-liter HEMI® V-8 with Fuel Saver Technology now delivers 475 horsepower (354 kW) at 6,000 rpm and 470 lb.-ft. (637 N•m) of torque at 4,300 rpm, and is mated to the fully electronic eight-speed automatic transmission featuring on-the-fly shift-map changing. 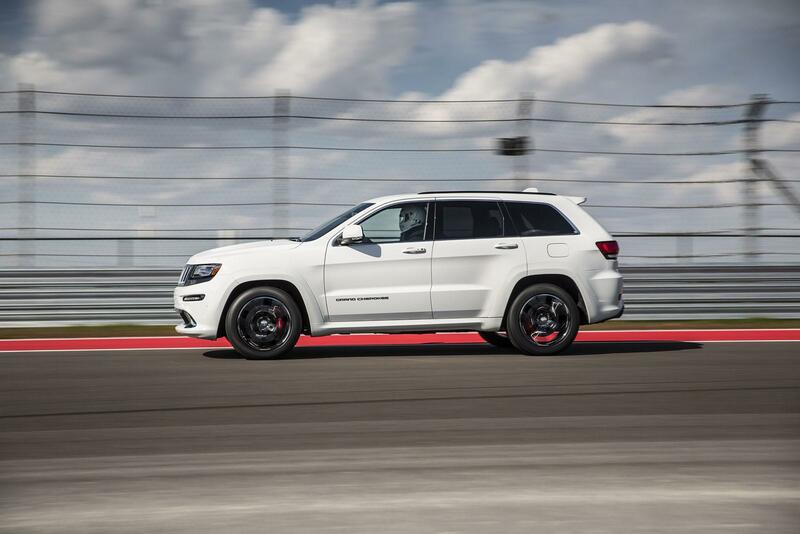 The 2015 Grand Cherokee SRT runs from 0-60 mph in 4.8 seconds, 0-100-0 mph in 16.3 seconds, can cover the quarter mile in the mid-13 second range, has a top speed of 160 mph, and brakes from 60-0 mph in 116 feet. For an even sportier, more driver-controlled experience, the eight-speed transmission can be manually shifted using ergonomically efficient steering-wheel paddle controls. Grand Cherokee SRT features an Eco mode that optimizes the transmission’s shift schedule and extends the range of the Fuel Saver Technology, which deactivates four cylinders when conditions allow. A button on the center stack allows drivers to engage Eco mode for improved fuel economy. The eight-speed automatic transmission is specifically engineered to optimize shift quality and shift points for fuel economy, performance and drivability. The intelligent software takes into account variables, including engine torque gradients, kick-down events, longitudinal and lateral acceleration, grade changes, friction detection and downshift detection to determine the appropriate shift map. 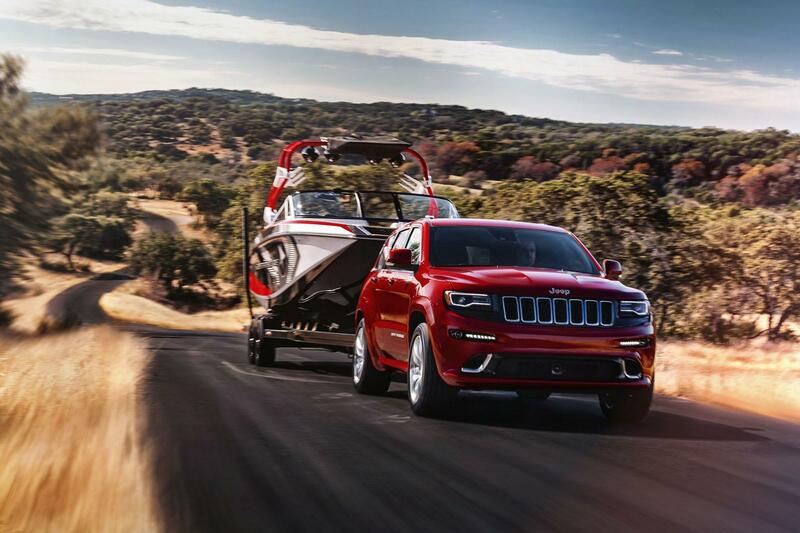 Towing capacity is rated at 7,200 pounds – a 44-percent improvement versus the 5,000-lb. towing capacity of the previous model. The electronic T-handle shifter provides the flexibility for drivers to choose a transmission shift schedule independent from the Selec-Track system. Drive and Sport shifting can be selected via the T-handle with no effect on the chosen suspension, stability control and driveline torque split settings. The standard launch control system mimics a professional driver’s inputs to optimize Grand Cherokee SRT’s performance by bringing engine, transmission, driveline, stability control, and suspension in line for a textbook launch. Controlled by a button behind the T-handle shifter on the center console, the result is improved and more consistent straight-line acceleration. 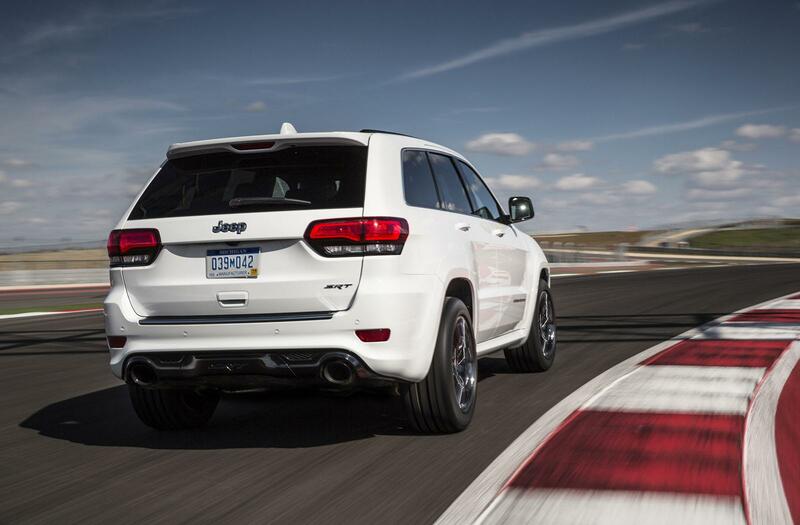 The performance experience of the 2015 Grand Cherokee SRT is further accentuated by transfer case proportioning and dynamic controls for the Selec-Track system when the vehicle is in Track Mode. When this mode is selected, 70 percent of the engine’s torque is delivered to the rear wheels for a more pronounced rear-wheel-drive experience. 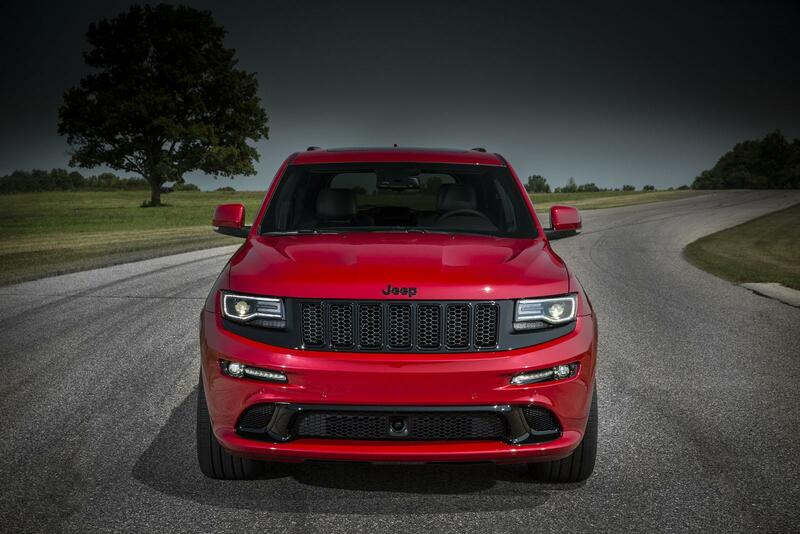 Grand Cherokee SRT drivers will notice a vehicle that is more responsive from mid-corner to exit. Outstanding ride, handling and capability Grand Cherokee SRT rides on a short- and long-arm (SLA) independent front suspension with coil springs, Bilstein adaptive damping suspension (ADS), upper- and lower-control arms (“A” arms), and a stabilizer bar. The Selec-Track system uses performance-tuned software to distinguish the five dynamic modes: Auto, Sport, Tow, Track, and Snow, enabling drivers to choose a vehicle setting that ideally meets their requirements and ambient conditions. Drivers will find the torque split change in Track mode provides a vehicle that is more responsive from mid-corner to exit and one that delivers faster lap times at their favorite track. Benchmark braking The 2015 Grand Cherokee SRT delivers excellent braking performance, requiring only 116 feet to come to a full stop from 60 miles per hour (mph). 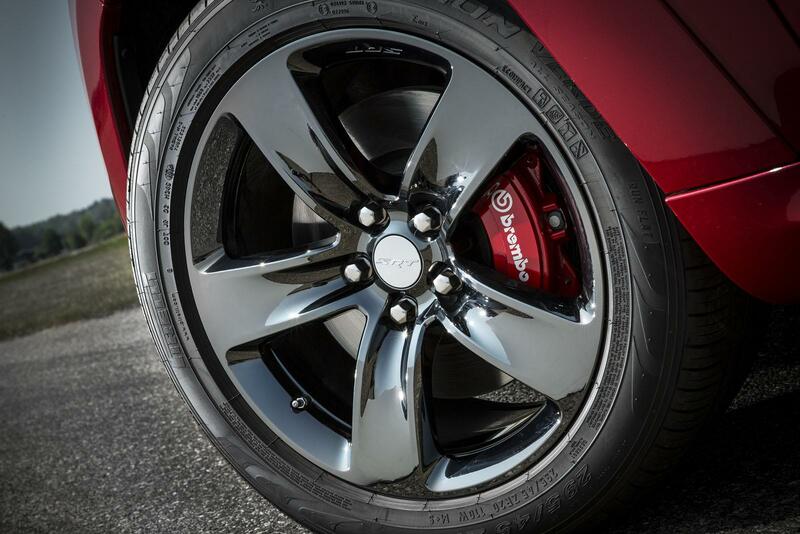 Credit belongs to red-painted, Brembo six-piston (front) and four-piston (rear) calipers, and vented rotors at all four corners measuring 15 inches (front) and 13.8 inches (rear). Aggressive and functional exterior The Grand Cherokee SRT sports its signature, seven-slot upper grille with black screen insert flanked by slimmer, adaptive, bi-xenon headlamps that are surrounded by a signature LED character lamp treatment. The headlamps feature a unique black background to distinguish the SRT from other 2015 Jeep Grand Cherokee models while further accenting their jewel-like appearance. The styling enabled designers to incorporate the headlamp washers into the headlamp housing – rather than on the bumper – for a cleaner more functional appearance. A Grand Cherokee badge, along the vehicle’s sides, features a distinct, pronounced font. The 2015 Grand Cherokee SRT’s front light treatment is mirrored in back for a cohesive styling appearance, and features larger tail lamps with signature LED lighting. To further emphasize SRT’s performance heritage, the tail lamps feature a black surround, creating the illusion of floating lamps. 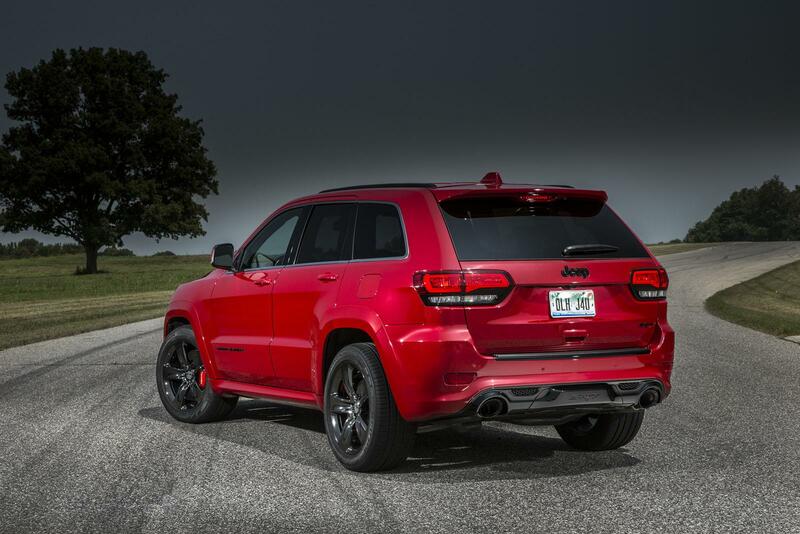 An aerodynamically efficient rear spoiler integrated into the one-touch liftgate features a raised SRT badge. Rather than relying on a manual lever, the liftgate is operated electronically with the push of a button. Standard five-spoke 20-inch Goliath wheels with polished finish ride on standard Pirelli 295/45ZR20 Scorpion Verde all-season tires or available Pirelli P Zero Three-season tires. Available split five-spoke, 20-inch forged aluminum wheels feature the “Spider Monkey” design in Satin Carbon or SRT-exclusive Black Vapor Chrome finishes. 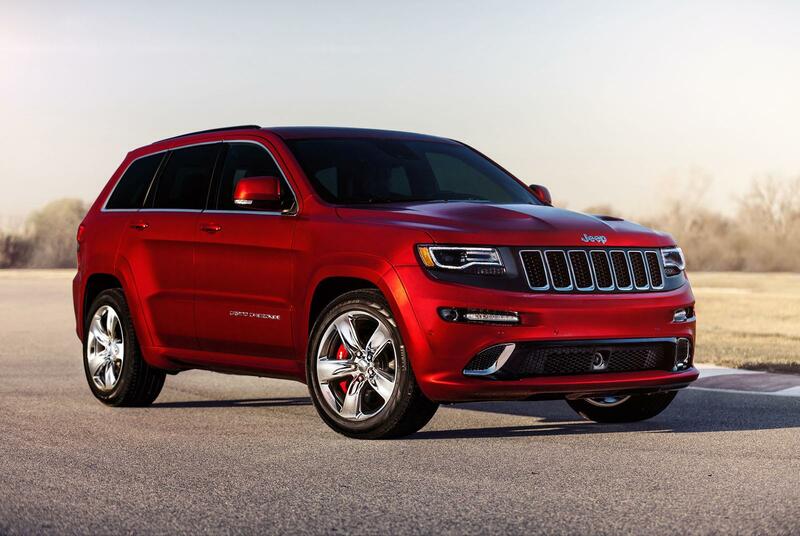 The 2015 Grand Cherokee SRT is available in the following exterior colors: Billet Silver Metallic Clear Coat, Bright White Clear Coat, Brilliant Black Crystal Pearl Coat, Deep Cherry Red Pearl Coat, Granite Crystal Pearl Coat, Maximum Steel Metallic Clear Coat and Redline Red Pearl Clear Coat. 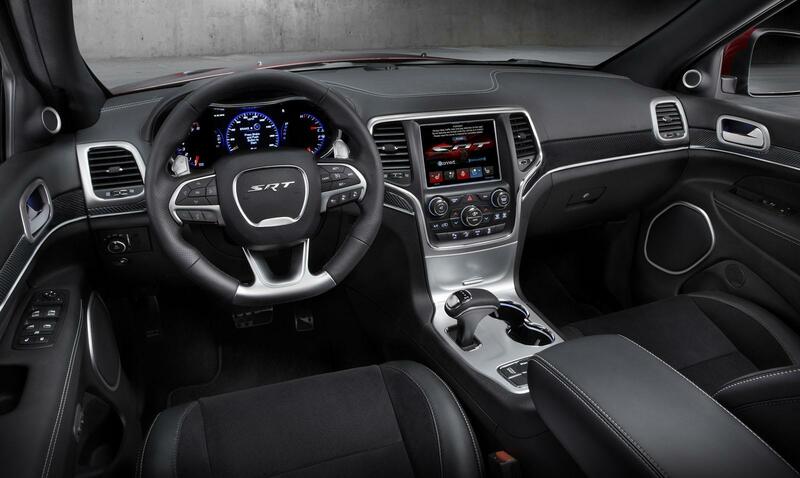 Race-inspired and high-performance interior The Uconnect 8.4-inch touchscreen display shows a wealth of SRT-exclusive Performance Pages, including recent track times, lateral acceleration, 0-60 mph times and much more. All data is shown in full-color and can be shared with other SRT enthusiasts via a built-in 3G connection. The same screen accommodates the Uconnect Access Via Mobile feature. With it, customers can stream their favorite music into the vehicle using the acclaimed apps Aha, iHeart, Pandora and Slacker. On the center console, drivers will find the leather-wrapped T-handle shifter for the eight-speed transmission that allows the driver to select two driving modes including Drive and Sport. 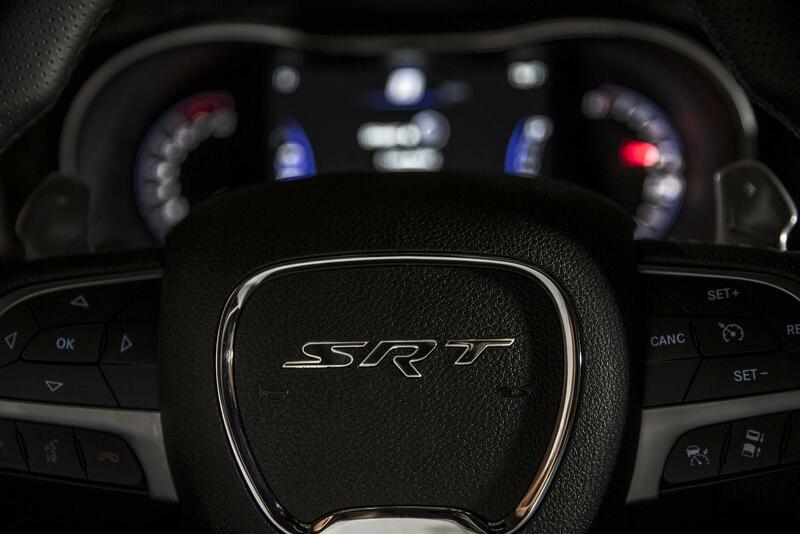 The SRT-exclusive heated three-spoke steering wheel with a flat bottom features a bevy of comfort, convenience and connectivity controls and more pronounced, more ergonomically efficient paddle shifters. The steering wheel is designed and positioned to provide optimal view of the gauge cluster that features a 7-inch, full-color, customizable instrument display. This screen allows drivers to select from a multitude of layout and information to be shown in the center of the gauge cluster. The available 825-watt, 19-speaker premium SRT performance audio surround-sound system from Harman Kardon offers world premier innovation, featuring a 32-volt tracking power supply (TPS) 12-channel Class D amplifier that delivers outstanding acoustics and brings multidimensional, quality sound for all interior occupants. The 2015 Grand Cherokee SRT Laguna leather interior is available in two distinctive colors: Torque (black) and Sepia. Enhanced security, convenience and occupant safety The Uconnect Access in the Grand Cherokee SRT is enabled by embedded cellular technology, and affords direct communication with local 9-1-1 service personnel at the touch of a button – no waiting for go-between call-center operators. In addition, the 2015 Grand Cherokee SRT showcases advanced safety features from Forward Collision Warning, which alerts the driver to rapidly approaching traffic, to Blind-spot Monitoring and Rear Cross Path detection, which aid drivers when changing lanes or in parking lot situations. 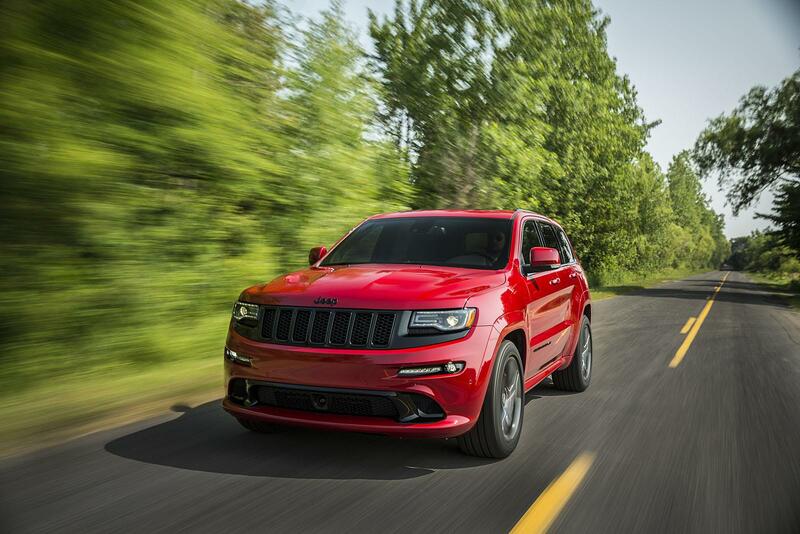 Manufacturing: Built in Detroit The 2015 Jeep Grand Cherokee SRT is built at the 3-million-square-foot Jefferson North Assembly Plant (JNAP) in Detroit, which has been the site of Grand Cherokee production since its introduction in 1992. SRT Track Experience Owners of any Chrysler Group SRT vehicle receive one day of professional driving instruction as part of the SRT Track Experience, designed to maximize their driving knowledge and skills on the street or track. Sessions are held throughout the year at selected tracks. For more information, visit http://drivesrt.com.